This post is written by Katrina Emery, a member of GirlFriendCircles.com who lives in Portland, OR. I read through all 750+ answers (I promise, I did! ), and am here to report with your answers. Because this friendship thing is hard, we all know that. There are aspects of it that we all struggle with, so while 750 of you out there may have commented about how hard it is to make new friends, you’re not the only ones. Solidarity, sister. We’re here to figure it out together. Let’s be honest, this one’s a bit boring. Everyone’s got time constraints, we all know we’re busy, there are a million apps promising to fix that, and none of them do. But we’re all here because we know that friendship is important anyway. The hardest part for a lot of you is the simple act of figuring out how to meet someone. You’ve carved out your time, but aren’t sure where to go. Or you’ve figured out where to go, but can’t tell what to say. Many of you also noted how hard it is to break into an established circle of friends. And a lot of you mentioned how hard it is to combat shyness and gather the courage to speak up. Lots of commenters said how much they hate small talk, and how difficult it can be to move past an initial meeting into something more meaningful. Shasta would describe it as moving circles, and it’s tough to bump folks up from acquaintances to something better. Even someone who can blaze through the first two challenges might get stopped up here. There were so many thoughtful and poignant comments around this topic, which shows that we all spend a lot of time really thinking about this. This was an interesting category to me. A lot of commenters mentioned that they were looking for a certain type of friend--one who fits with their own idea of what they’re looking for, or one that shares all the right interests. This makes sense. We all want people we like, who understands where we are in life. Because we’re all going through struggles, and we think that no one can help unless they’re going through that same struggle. Many commenters wrote about how challenging their own situations were, and their barriers to making friends. And here’s what I noticed: they were all different, and often contradictory. Having a demanding job, working a weird schedule, not working at all, working as a stay at home mom, having teenage kids, having kids under 3, being a single mom, being single with no kids, being married with no kids,… everyone mentioned how hard it was for them. Which just goes to show… it’s hard for us all. It really is. We’re all kind of freaked out by it. Other than time (though, we could make an argument for that), this one sums up all of the above challenges. They’re all about being afraid of being judged, of being not enough, or too much. That’s why I thought #4 was especially tragic. We’re all looking for a specific kind of friend and telling ourselves that those who don’t fit our categories aren’t good enough for us, while being inwardly terrified that we’re not good enough for other people’s categories. First, let’s all take a moment to congratulate ourselves on admitting that stuff. Good job! Now that we’ve done that, let’s congratulate ourselves on being here, wanting to do something to tackle those challenges. It won’t happen immediately, but the more we reach out, send an invite, risk chatting to a new person, or move past our shyness to be a little vulnerable, the better we’ll get at it. Because if there’s anything that reading these 750 comments taught me, it’s that these challenges aren’t so unique, after all. I asked the women of GirlFriendCircles.com last week what their friendship and connection goals were for the month of January and their answers were so inspiring that I thought I'd share a few of them with you just in case you want to set an intention, too! I've repeatedly found that those of us who are most able to move our desire for meaningful connection into actions we can take tend to feel more empowered, hopeful, and effective. I encourage you to join us and name an intention that you feel will lean you toward the frientimacy you ultimately want! Value the Long-Term Growth, Skills Training, and Practice! "Keep up with the Year of Frientimacy course and take one action step suggested in the book for January." -- T.
What a list!! If you haven't yet named your goal-- it's not too late to do so! Name one for yourself! Share it in the comments or join GirlFriendCircles.com (it's free!) and add it to our growing list! Speaking of GFC-- here are a couple things we have going on in our friendship world this month in case any of them would serve you in your goal! Join GirlFriendCircles.com for FREE to meet women near you and to stay encouraged in your friendships all year long! Join our "2018: Year of Frientimacy" --a 13 week program where you read Frientimacy: How to Deepen Friendships for Lifelong Health and Happiness and evaluate all your relationships and put together a strategic plan for better friendships! May we all feel inspired to do one thing this month that we feel will strengthen our friendships! I returned Dawn’s call on a Tuesday, and we reconnected for two hours of talking and laughing. We hadn’t spoken for three years, which is just part of the rhythm of our friendship. Sometimes we’re in-touch, sometimes we’re not. Maybe that’s bound to happen when you’ve been friends since preschool, but it’s a cadence that’s always been fine with me, and I think fine with her too. After our conversation, a delightful little thought started percolating. It would be great to connect in person. Dawn should come out this weekend for a visit! The weekend was only three days away, she lived nine hours away (in Nebraska), and it was Easter Weekend, so there were possibly a few obstacles. However, I knew my friend well, and quickly marked off each potential hindrance. Dawn was actually a fan of last-minute get together plans. We’d done the last minute “wanna do lunch today?” countless other times, even when we lived an hour away in different towns. Check! I knew she didn’t exactly live on a shoestring budget, so the expense of a trip likely wouldn’t be an issue. Check! And, she wasn’t that into organized religion, so it seemed unlikely that she’d have conflicting religious commitments for the Easter weekend. Check! Every obstacle -- crossed off! Well, every obstacle that is, except one. There was one last annoyance nipping at my heels: Connection Perfection. Connection Perfection caused me to fear that Dawn would look at my not-quite-finished home and conclude that I was inadequate. It made me want to chuck the delightful idea of inviting her out like a hot potato. Connection Perfection is not our ally. It makes us think we’ve got to get our life perfect before we reconnect with an old friend. It makes us feel nervous, inadequate, and sometimes even ashamed. It says things like, you’ve got to write the perfect email to reconnect. Or, you have to lose weight before she sees you. Or, don’t even think about having people over unless your house looks like it belongs on Pinterest. No need to fear, though. We can outmaneuver Connection Perfection! Think about your actual experience with your friend. Has she ever been anything other than happy or receptive to receive an invitation from you to connect? Has she ever been critical of your emails, your body, your home, etc. in the past? Does she expect perfection from you? Surround yourself with people who are also exercising courage in their friendships. I’ve read Shasta’s books and am a member of GFC, and both reminded me that it’s perfectly normal to feel a little nervous when extending an invitation. They gave me the support I needed to follow my instincts and invite my friend out for a visit. Distinguish the feelings that come from Connection Perfection from those that come from excitement. Both can elicit feelings of nervousness, hesitation, or fear. Connection Perfection, however, also tends to bring with it negative appraisals like, “I’m going to be judged,” “I’m going to be exposed for the fraud I am,” or “She’ll see me as inadequate.” It tacitly expects our friend to be a harsh, unforgiving judge, whereas the excitement brings hope and possibility. “That’ll be fun,” or “Something great is about to happen” are the appraisals of excitement. I invited Dawn for the visit. She flew out, and we packed in activities and connecting, and had a fabulous time. We laughed and talked personal growth and politics at the dining room table. During my husband’s and her golf game, we chatted and laughed uproariously while zipping from hole to hole in our golf cart. We went out for dessert and caught up about our families. She, my husband, and I lounged Saturday morning, watching favorite comedy bits on Youtube. We meandered around a fine art gallery, and made ourselves at home in two cubist leather chairs in the middle of the room, swapping sordid stories about a few choice teachers we’d had growing up. Best of all, Dawn and I got to connect face-to-face at this point in our lives. A lot had gone on in three years. I showed her my new town and home we’d moved to, she shared about her divorce, and I got to meet her new boyfriend through FaceTime. There’s no one in the world like Dawn, and certainly no one who has her place in my life. She’s incredibly quick-witted, upbeat, and expects that situations will turn out for the best and life will be good. She’s the most self-confident, least neurotic person I know. The whole weekend, Dawn -- of course -- didn’t have one iota of judgment about any not-yet-finished aspect of my home. On the contrary, I just felt supported, known, and believed in. I can’t believe I might have let Connection Perfection keep me from building all of these rich new memories with such a good, long-term friend -- a friend who, by the way, was too busy connecting with me to even notice, let alone care about my non-existent baseboards. Tricia Andor: With a master’s degree in clinical psychology and sixteen years experience as a Licensed Professional Counselor, Tricia Andor uses the best psychology-based tools to help you stay focused, be kinder to yourself, and dream bigger. Get her free guide, Better Together, which shows 7 things she did (that you can do too) in one week to make more and deeper connections. When we want to make new friendships, we're often dismayed at how challenging it can feel. Katrina Emery, a GFC member who lives in Portland OR, recently interviewed Maggie Chang about how she ended up seeing a move as the best excuse to start over with greater intention! Maggie Chang had lived in New York City all her life. Her big move had been from Queens to Brooklyn, and that was far enough. But moving to California? Terrifying. “My husband made me do it!” she laughs. At first she had scoffed at his suggestion. She was perfectly fine, had family and friends nearby, and California was so far away! Gradually she warmed up to it, though, and two years ago she, her husband, and her then-9-year-old son found themselves new residents of San Bruno, right outside San Francisco. She tackled the move by pursuing new interests and passions, which was also a way to make new friends. After adopting a dog, she started volunteering at SPCA (Society for the Prevention of Cruelty to Animals). She’s gotten outside more: hiking, beaches, dog parks, camping, exercise, yoga. Her yoga passion actually led her to a deep friendship journey, in a roundabout way. In researching a yoga retreat, she ended up at Shasta’s New Year Retreat (“Reveal: A weekend where good friends dream up a great year.”). “It definitely wasn’t yoga!” she laughs, but she ended up loving the chance to delve thoughtfully into her own wisdom and intuition. The retreat offers women a beautiful place for guided personal reflection and facilitated group connection designed to reveal the themes and feelings that will best lead each person in the year ahead. Maggie used the intention created at the retreat to focus on her relationships, and it was there that some realizations about her life in Brooklyn came up. “I was not actually happy in NYC,” she says, “not very connected to the friends and family I had there.” She hadn’t realized it at the time, but there was a distance growing in her old friendships that wasn’t being addressed or augmented with new ones. She discovered she had been suffering from a lack of meaningful healthy friendships for a while, even before moving. The research that shows we replace our friends every 7 years was especially striking to her. “Nobody teaches us these things!” She had been stuck in past versions of friendships that had changed. “There was some shame connected to it,” she admits, noting that since she claimed she had current friends (even though the dynamics had changed), she felt uncomfortable searching for “new” ones. Since moving to California, Maggie describes herself as being more intentional and more mindful of friendships. Her son, now 11, has his own friendships at school. “I’m now encouraging him, making it an actual goal.” she notes. “I want him to know that it’s important enough to work on.” She hasn’t found the perfect way to be vulnerable to him about her own friendship struggles, but hopes she can keep working on that. “One new struggle that has popped up is: Should I be making friends with moms of kids his age?” she wonders. More requirements for hopeful friendships (that they live close, that the kids get along, etc. ), though, just ends up adding extra layers of complications. Two years in, and Maggie still feels she’s in the middle of the transition. Her advice is to embrace the uncomfortable: “You’re going to learn and grow from change, so let it happen.” With the freedom of a new location, the pursuit and opportunity of new relationships is an important part of her life. “I’m not saying it’s easy or doesn’t take work, but I’m starting to meet new people and start new relationships.” She sounds hopeful. And proud of herself. And she did find an actual yoga retreat to go on recently. An intense camping-and-yoga experience, the women there naturally bonded, and Maggie is hoping they can continue to form some meaningful friendships. She’s also already signed up for Reveal Retreat again this January, looking forward to connecting with other personal-growth minded women! **By the way, if you’re interested in more information on the next Reveal Retreat, January 20-22, 2017, in wine country, CA, check it out here! 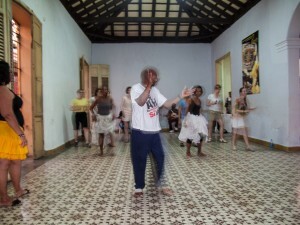 http://www.shastanelson.com/retreat/ There are still a few spaces left! I'm actually in Greece with 10 women this week on a TravelCircle trip. But before I left, I scheduled this post from the group of women that just returned a few weeks ago from Nicaragua. Pulled together by Michelle Scott, one of our TravelCircles ambassadors for GirlFriendCircles trips around the world (she's also leading the one to Chile & Argentina this November!) she asked her fellow travelers to also contribute to the story. This group of 4 women was significantly smaller than most of our trips (which typically average between 8-12 women), but they proved that all it takes to have a good time are amazing women, an amazing country, and an amazing itinerary! :) Welcome home, GirlFriends! 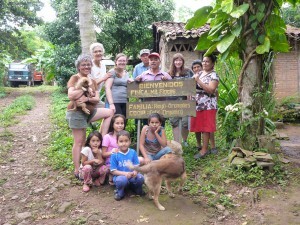 Four ladies chose to travel through Nicaragua on a GirlfriendCircles’ eco-adventure. None could have predicted how they would bond, how much they'd enjoy traveling together, or how inspired they would by the beauty of the country and people. Chance, Wren, Erin, and Michelle travel Nicaragua together, coming home as friends. Chance: I met Wren through Girlfriend Circles a couple of years ago, and she encouraged me to travel with her to Nicaragua. Though I have traveled extensively, no trip has changed and inspired me like this trip. As we flew into Nicaragua, the clouds parted to reveal a vast lake (Managua Lake) and its many volcanoes; it was breathtaking and a perfect welcome to this enchanting country. Soon, we were lunching with a famous Nicaraguan feminist leader and learning about the women’s rights’ movement and its interplay with the revolution - over fresh tortillas and gallopinto (red beans and rice). Some of my favorite experiences were visiting an active volcano, a powerful waterfall, and touring two farms. 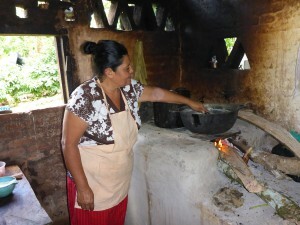 We cooked nacatamales and tortillas over a wood stove in Doña Elsa’s open kitchen, toured the coffee, bean and rice farm, and received a hands-on botanical medicine tour. The people of Nicaragua were the highlight. Our local guide, Nohelia, told us that Nicaragua is built (and rebuilt) with “manos y corazón” – hands and heart – and I witnessed this. 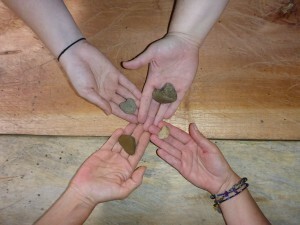 The four women who bonded through travel-- hearts and hands! People work toward betterment for their communities and country, with pride, humility, and a focus of purpose that is tender and passionate. Nohelia is one of the best examples of this. As a young woman driven to improve her community, she saw the illiteracy in her neighborhood, designed and launched a radio show to teach literacy – a program that continues to graduate a class every three months and has made her a sort of local celebrity. So, how was I changed through this trip? I took an open heart to Nicaragua, and throughout our journey, it was filled with love, inspiration and care. I hope I left love and respect there, and a deep caring for the people and places I saw, along with some deep friendships – with both my fellow travelers and citizens of this amazing country. Wren: I wear a black rubber bracelet, which states “No a la trata de personas” – No to trading people. I received the bracelet from Casa Alianza, an organization that provides food, shelter and essential services to homeless, trafficked and exploited youth. As a former teacher, children hold a special place in my heart. I wear this bracelet to remind me of where I’ve been and the people I’ve met. Nicaragua’s people and landscape hold such beauty, simplicity and friendliness that one cannot help but fall in love and promise to return. Michelle: There are few places and people that sneak into your heart and forever change you. I went to Nicaragua to be re-charged and inspired and received that and so much more. Chance, Wren, Nohelia and Erin will be my lifetime friends. We are bonded through our experiences, our love for each other and the people of Nicaragua, and a fundraising project with Grupo MOES, an organization committed to respectful empowerment of women, affected by poverty, violence and exploitation. Erin: Prior to this trip, I was asked, "Why go to Nicaragua?" My photos partially answer this question - trotting horses through a Nicaraguan jungle, while monkeys swung overhead, standing next to a smoking volcanic crater, and hiking behind a waterfall. A few of the amazing moments included careening through a mountain town with my new girlfriends and a Bolivian man, who owns a waterfall and cemetery (neither of which I knew were things one could own), leaning over the edge of a boat and dipping my fingers into the world’s only freshwater lake with bull sharks, and hiking steep uphill climbs to meet an 85-year old artist, known as the hermit stone carver, who guided us through the jungle to his carvings, reciting poetry and picking mangos for us along the way. But the true answer to “Why [I needed] Nicaragua?” has more to do the spirit of the people we encountered than the adventures and excursions. I went to Nicaragua to learn that inspiring and world-changing people see a problem and work towards a solution. They teach literacy over the radio. They build a home and school for young survivors of abuse. They begin a sewing cooperative with women constructing the building from the ground up, where each worker is a co-owner. They realize that handpicking coffee beans allows them to organically remove bugs and guarantee high quality. I went to Nicaragua because I needed to be reminded that you don't have to live in a tropical paradise to live a beautiful, fulfilling life. All you have to do is work with your hands and heart towards resolving a problem that matters to you. All women over the age of 21 are invited to join any of our TravelCircle groups where women travel together to connect with one another and to go experience together the life and voice of women in their destination country. Every trip has so many special elements in it including a local female guide, visits to NGO's to learn about the issues facing women in that country, cooking/dance/art classes, and a GFC ambassador to help foster connection among your group. In talking to Tiffany this fall she kept crediting GirlFriendCircles with giving her a circle of friends who helped her through a health crisis. I'd say all credit goes to her for fostering friendly people into friends, but her story was so inspiring, I asked her if she'd be willing to share it with all of you! Tiffany was a member of GirlFriendCircles.com in San Francisco, CA for nearly 2 years and is still a huge advocate and ambassador. Yes, it was right after Memorial Day and I ended up needing to go to the hospital because I was in so much pain. I couldn't have guessed upon arrival that they would be telling me that not only were they keeping me there, but also that I needed emergency surgery. And how did you respond? Well I immediately called two friends of mine (one whom I had met through GirlFriendCircles.com) and they put out the word about where I was and what had happened. Three of our friends, who we had also met through GirlFriendCircles.com (GFC), came and spent hours with me in the emergency room so I wouldn’t have to be alone. (What makes this even more special is that one of them is an avowed germaphobe who avoids hospitals!) My surgery ended up becoming a 3 ½ day hospital stay. And there was honestly not one day that went by that this amazing group of women did not call, visit, text, etc. I am convinced that the love and support from them is what made the healing process go so quickly. I spent two weeks recuperating at home and the “amazingness” continued. People visited, called, texted, brought me food, took me to doctor’s appointments, stayed with me when I needed it…. It was a truly humbling experience to be on the receiving end of that much love. Before all this happened, I had in my head that these women were my “village” and it was gratifying to know that it translated to real life! Take me back to that moment when you realized you actually had friends who were supporting you through this crisis… what did you feel? I felt incredibly blessed and grateful. I met all these women through GFC. The women who show up to GFC, and are intentional about making friends and building community, really do make the world a better place to live. As a single woman who doesn't live near family, I basically lived through a crisis that would have been so much worse had it happened a few years ago, before I had built up a circle of friends. We've all had times where we've wondered, "Who would I call in an emergency situation?" and this time, I knew the answer. Oh that makes me so happy to hear! How did going through this together impact your friendships? The ultimate impact of this was that my FRIENDS became my FAMILY in the truest and best sense of that word. Even though I was the one who was sick, we all now know that we have each other’s back when the chips are down. We have a community where we lean on each other and celebrate each other’s wins. We've proven it to ourselves! It truly was an amazing experience to be a part of. To me, it's not too big of a statement to say that none of it would have been possible without GirFriendCircles.com. To meet women who were ready and willing to develop meaningful friendships literally gave me a support system, a tribe in this city. My take-away is that it is so worth it to invest the time and energy into building a network of female friendships. I am convinced they are the root of a happy and successful life! You're so welcome Tiffany. Thank you for jumping in, meeting people, and taking the time to foster friendships-- that's where the magic was! Tiffany attended 8 Connecting-Circles & 1 Friendship Accelerator during her membership in GirlFriendCircles and that combination of involvement has given her a strong circle of local girlfriends. Friendship Accelerator: And if you, or someone you know, lives in New York City, San Francisco, or Las Vegas-- I'll be in those cities in early 2014 offering Friendship Accelerators! More info here. Shoshana: "I can't remember exactly how the San Diego trip came about, but after talking about going to Santa Barbara and maybe renting a house for the weekend, we ended up landing on San Diego since most of the girls could only do one night. I then created a Facebook page for the trip and invited everyone to join. Another one of the girls made the suggestion to take the train and we were off. I reserved rooms for us at the Hard Rock Hotel and for our dinner, collected everyone's money through Paypal or checks, and posted on our Facebook page all the info that everyone needed, including which train to buy their tickets for. We got seats together and talked for 3 hours the whole way there and back. It was definitely a great way to travel with 11 girls. I'm not so sure our neighbors on the train would agree!" What did you all do together on this trip? Shoshana: "We hung out by the pool, had a great time eating dinner together, and basically just hung out together. A highlight was definitely dinner! We were seated in front of a big window on a busy street so a lot of men enjoyed dancing for our big group of women in front of the window or ripping their shirts open which produced a lot of fun laughs. (We were in San Diego's Gaslamp district so it's a very fun scene.) After dinner we went to a place for dancing for a little while before hitting up a rooftop bar. But my favorite part of the trip was getting to know the girls better during the train ride down and back where we could all just talk. The going out and pool part was fun, too, but the activities mattered less to me than the time I got to spend connecting with these great women." Okay, bringing in a few other GirlFriends-- tell me what you were feeling on your way home from this weekend! Yana: (a member since Dec. 2012, who first went on a one-on-one and then started meeting others through ConnectingCircles) "On my way home from San Diego as I looked around at this group of women, I felt..... like part of a community and grateful to have these amazing women in my life! Why? It was such a diverse collection of women of all backgrounds/ages/professions and yet we all took the initiative to get together and go on an overnight trip. Eleven girls traveling could be a recipe for disaster but everyone had such a good time eating, dancing, and socializing." Kelly: My first event with GFC was last October. I signed up for the site after Googling "how to make friends in LA." Moving from another state, I found it really hard to connect with people in this city. But on my way home from San Diego, I felt really happy knowing I'd met an awesome group of women who are all interested in making friends and sharing new experiences. Looking at the group of women that spans the age range of 26-44, its amazing we all met over the past 6 months and have become friends that hang out all the time. I've finally connected! Nina: I feel like I'm super lucky to have gotten to know such a lovely group of women. Each and every one of them has been committed to developing friendships. They are an open-minded, kind bunch of girls who simply likes to have fun and experience life together. I moved to LA 7 years ago, and up until this point... I had really struggled with forming close friendships with women in LA. I had girlfriends, but hardly any of them were local. Now I have this group of supportive SoCal women in my life that I couldn't be more thankful for. As for specific memories from the San Diego trip....when we were eating dinner, we kept drawing attention to ourselves b/c we were such a big group of women sitting by a window. People kept waving at us. A little boy even kept coming up to our table to perform dances for us. It was super fun to get away and spend time just chatting/ really getting to know the girls that I roomed with. 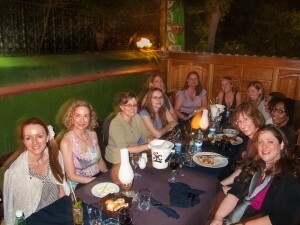 Stephanie: My first event with GFC was only a month or two before this trip! I went to a happy hour in Venice, organized by Shoshana, in the first part of June and met half a dozen women, most of whom came to San Diego. On my way home from that trip... as I looked around at this group of women on the train with me I felt a few things: Very proud of myself that I had reached out, risked being vulnerable and asked for friendship, and also lucky to be in the company of women who are making their way with courage, openness and a sense of self that just nice to be around. We had all had fun in the group as a whole, but some of us had broken off into smaller groups and done our own thing. It seemed like everyone was content with the weekend happening whatever way made everyone comfortable. We all had each other's backs at the clubs and if someone needed out of a situation, there was someone there to extract them. Shoshana: Yes! One of the important things we learned about group travel was to give everyone the freedom to do things in their own way. For example, the distance from the train to the hotel was about was a mile so some of us walked and some of us took a taxi. We then all had a late lunch all together, but then again some of us lounged by the pool while some went to go get manicure and pedicures. At around 6pm we all headed to our rooms to nap/relax/get ready. And again, a few of us were ready first so we went downstairs to sit outside and grab a drink before the others joined us. The wonderful thing about a group that size is that we don't all have to do everything together, but that we could break into smaller groups when appropriate! So many of us would love to go on a trip with friends... what so you think specifically helped you build these relationships? In other words, how did you get to this place? Yana: I moved to L.A. due to a long distance relationship and a year and a half later still found myself unable to make the city my home. I took the initiative to search for websites to find friends and dove right into making connections and going to events. What specifically had to happen to create these friendships? Not being afraid of rejection and making the time and commitment to nurture and grow these relationships. I feel like at this point in my life (engaged, new puppy, planning wedding, working in finance) I just don't have the luxury of being in high school and surrounded by people also ready and willing to make that connection. As I didn't go the traditional going away to college and living on campus route, I don't have those 4 years to go back to for friendships. As I get busier and busier it's important to make time for building a foundation of friendship in a new place without the luxury of old friends and family to have my back. Kelly: We got here because a lot of the girls in the group were proactive in creating their own group events on the GFC CalendarCircles. That made a huge difference. People started inviting other girls from the site they had met individually and pretty quickly there was a larger group of girlfriends. Nina: My first event with GFC was a Connecting Circle in November at Cafe Gratitude in Venice, CA. I believe there was 5 other girls present, 4 of whom have become close girlfriends of mine. My first impression was something like "Wow! these girls are really nice and normal!" I was pretty skeptical going into the whole process since I had previously tried to meet some girls in LA via craigslist and had some issues with flakiness, lack of commonality, etc. I was assuming GFC would be more of the same. But I knew from the very first night that my experience with GFC would be different. The girls were intelligent, sweet, funny and truly open to making friendships. I reached out to a couple of the girls right away after my first Connecting Circle to meet up for coffee or dinner. I think this was the most important step I took, because it ensured that I began to form relationships with some of the girls. Stephanie: I could see myself being friends with some of these women for a long time. Some I will perhaps get closer to, and some will come and go. I think acceptance of each other for who we are is very important, not having too many rules for others to follow, and knowing what my own expectations are from the friendships are important. I didn't expect to come away with a new BFF - but I may have found a friend or two who I would like to travel with in the future or have other adventures with. I really loved that so many of them were like me - okay doing things on their own but also happy to be in a group. It's been a long time since I've had a weekend with women that I came home and felt like the whole thing was a great time. A very nice memory and (hopefully) the beginning of some new friendships. Any advice would you have for other women just joining GFC? Yana: Sign up and reach out to people out of your age range/economic background/likes. It's a bit more difficult to do that in L.A. due to the city being so big and traffic dictating what one does during the week, but weekends are the best. Go to events and make events of your own and don't be afraid to mix your "GFC" friends with connections you've made outside of the website. Kelly: Try to go to as many of the CalendarCircles and ConnectingCircles as possible because you will meet many different kinds of people and are bound to eventually find one or more new girlfriends you really connect with. Nina: Even though I met amazing women at the first event, I also continued to attend ConnectingCircles to meet more girls. Once I started to get to know the girls more, I simply made sure that GFC and these ladies were a priority in my life, by attending as many group/ individual get together's as I can. I even set a specific goal to make sure that I got together with at least one of my new GFC friends at least once/ week and chatted with other girls in between. After awhile, the friendships became more natural. I would definitely recommend taking initiative in reaching out to girls you click with. I also would make sure you make time/ prioritize your new friendships as well. A huge thanks to Stephanie, Yana, Nina, and Kelly for being willing to share a little of your experiences, and a HUGE thanks to Shoshana for being a catalyst. What a gift you gave, not just to yourself, but to all these women. May we have more women like you who are willing to put events out there to help women connect. There will be friendships formed because of your initiative. THANK YOU! A Success Story: Shoshana is Making Friends in L.A.
From Shasta: This is a blog post written by Shoshana K., a member of GirlFriendCircles.com, who is 30, lives in Venice Beach, CA with her boyfriend and two dogs. She runs two charitable foundations and volunteers her time with Big Brothers Big Sisters and developmentally disabled adults. I think it's so important and inspiring to share our stories with each other! Searching for Friends Online? While on vacation in Mexico last October celebrating my 30th birthday, my boyfriend and I were discussing how hard it was for me to not have my friends living nearby. I grew up in Orange County, but have been in Los Angeles for several years--it's amazing what a little distance can do to friendships. Between graduate school and working full-time for many years, with no time to go out or to meet people/foster new friendships, I was feeling the absence. My boyfriend has nice friends who I enjoy spending time with, but I really felt like I should have my own friends as well. He jokingly suggested there should be a site that exists to make friends similar to a dating site (we met on Jdate almost 4 years ago). So I pulled my iPad out and searched on Google. I found GirlFriendCircles.com, liked what I saw, and decided that I would join when I got back to LA. I approached the whole experience in a positive and open-minded way. I knew I had a lot to offer potential friends and knew what I was looking for in a group of friends. My first event was a ConnectingCircle [small group gatherings of women organized by GFC] at Cafe Gratitude in Venice a few blocks from my house. I was looking forward to meeting new women so I was excited, but definitely also a little bit nervous. Once I got there though I was very comfortable and had a great time talking to the 5 other women I met. The event was a lot of fun, I found it easy to find things to talk about, and the whole thing felt really natural and relaxed. Afterward, I was definitely looking forward to getting together with some of the women I met and also excited about attending another ConnectingCircle. I think GirlFriendCircles.com clicked for me really quick. I have always had big groups of women in my life: girl scouts, teams, clubs etc. So it was very natural for me to meet women in a group setting. I have found that so many women are just looking to connect so GFC has been the perfect vehicle for me to make new friends. I will say that actually not being afraid to follow-up and call or text or e-mail another member is huge. I think getting over that initial fear of rejection is a big step. Now my friendship circle consists of about 13-15 women I have met from the site. There are a handful I have seen more frequently than the others. We have done hikes, fitness days, birthday celebrations, meals, and many more activities together. When I first met with Nina for dinner after my second ConnectingCircle we had a long conversation about our love for reading and expressed that we both wanted to be a part of a book club. She suggested starting one so we got a few other girls interested. We started with maybe 4 girls and have added a few more. She really was the catalyst that started all of this and she continues to maintain the Facebook page and list of potential books. Additionally, she just organized a comedy event and has also talked a group of us into doing a 5k with her in a few months! I have put together a few fun nights out/in, as well. The first was just at a fun restaurant/bar that about 15 girls attended and then I had a wine night at my house. I am hosting another wine/game night in a few weeks that about 10 girls are attending so far. It's just amazing to me that I met so many really great women through this community. I might not have everything in common with every single one of them, but I have more than enough things to connect on and we have had so many great times together. I feel like they are there for me and are understanding and supportive and most of all fun to be with. The beauty of GFC is that we are all on the site looking for the same thing. And we found it in each other. Want to inspire others? Share your friend-making story with us at shasta@girlfriendcircles.com! What has worked? What hasn't? Want to see other inspiring stories from our members? Here's one from an Ambassador in Chicago (we recently begged Kathy to become our Ambassador director in case you want to get more involved in that way!) and here's two real stories from NYC! Note from Shasta: Over 80% of our members who have attended at least 2 ConnectingCircles say they've made at least 2-3 friends. The odds are good... what I love about Shoshana's story is that she went to more than one ConnectingCircle, found more success when phone numbers were exchanged and follow-up plans made, and she continues to post and RSVP to events where she not only keeps fostering her newly made friendships for herself, but also keeps giving the opportunity for others to join and connect! Thank you Shoshana for sharing your story! With thousands of new members joining GirlFriendCircles.com in the last few weeks from across the U.S. and Canada it reminds me how many women know the value of new friends and are willing to do something about it. For some of you, just signing up and trying to muster up the courage to post your photo, complete your profile, or RSVP to an event will be all you can do to prove to yourself that friendships matter to you. And that's okay! We all take the steps we can! But for some of you, you may feel as though you have a bit more in you to move you forward in your friendship journey. This is an interview with Kathy Lombardo, a GirlFriendCircles.com Ambassador, who I was lucky enough to meet at my Chicago Book Party last month! She lives 30 miles outside of Chicago in Darien, IL and knows what it's like to feel discouraged at the lack of stuff going on in her area. But her willingness to respond with hope has made all the difference! She's a 46 year-old Neonatal RN who decided to not only make her own friendships happen, but to also help make it happen for others! You don't have to become an Ambassador to be inspired by her story and see ways you can make friendships happen for you! Shasta: When you first joined GirlFriendCircles.com, you were undoubtedly hoping for tons of new friendships in your area, but since you live 30 miles outside of Chicago, we weren't that robust in your area, right? So what did you feel and how did you respond? Kathy: Yes, when I first joined GirlFriendCircles.com last Spring after hearing you interviewed, the web site told me that there were not enough people in my area to match me with. I was disappointed because I had been so excited to find an avenue for meeting other women who I thought may have a similar desire for the kind of friendship I was yearning for. I was also surprised because I did live close to one of the largest cities in the country. Thus…I got off the computer that day dejected. Eventually, you decided to take matters into your own hands and become an Ambassador for GirlFriendCircles.com in your area! What prompted that? Was it a hard decision? I do not remember what prompted me to take matters into my own hands but I know that I had chosen to continue to receive your blog and various e-mails. In fact,I ended up using one of your blogs about how you wanted people to feel in your presence as a template for the vows I used in a marriage-to-myself ceremony last Fall. Then I think I must have read something about becoming an Ambassador in one of your e-mails? Regardless of the prompt though, I remember that it was about 6 months after I had first logged on to GFC that I decided to get back on and “make this work” for me. I decided that instead of dejectedly giving up on my dream, I was instead going to do whatever I could to make it a reality. If I was going to go down; I was at least going to go down fighting! This made my decision to become an Ambassador a no-brainer. In fact I was eager to do so, believing it would lead me down the path to what I was looking for, or I'd at least die trying……lol! After reading your book, I realized I was doing exactly what the heart of your message is, “creating a meaningful circle of girlfriends”. As you say, “friendships don’t just happen” and I clearly realized this and was going to go from wishing for it to intentional action to create it. That's amazing Kathy. How glad so many of us are that you decided to come back and give it another shot! So, after you then signed up to help be this catalyst for friendship, what are some of the first things you did? After I signed up I spent time navigating my way around the GFC website, which I hadn’t really done when I first went on. I created a profile with a picture and went in search of friends. I had not seen this feature previously because I don’t think I really understood how GFC worked. I then went about “friending” many women in the city and in the suburbs. I also found the Calendar and created an event. The first event I created was to a book launch party in the city last November, which I was helping out with. Four or five women signed up to go and only one was able to make it but I did meet her that night, and brought back the book for another. It was a small start but it was a start and I was very hopeful! When did you first sense that things were changing? What signs did you start to see that gave you hope? I think I first sensed that things were changing when I decided to take action. There was an immediate shift in me, which translated into a shift in my circumstances. “Friending” women on my own, putting my work zip code as well as my home zip code, finding the Calendar, and creating events is when the hope really kicked into gear! I saw that there was more much for to this than actually just waiting to be matched. Having been an Ambassador now for 6 months (is that right? ), what would you say have been the pay-offs or benefits for you? Yes, about 6 months, maybe less. The benefits have been tremendous! Just making the decision was a huge benefit. But then deciding to put my all into it is what has given me the biggest rewards. I took it very seriously and put up events as suggested and went to events and ConnectingCircles as much as possible, asked questions of Maci, became a book circle leader, signed up with Big Tent with other Ambassadors, posted questions and answered them in the forum, put up fliers, followed-up with people, and continued to do all of that over and over. Wow. I am so touched how seriously you took this. Thank you so very much. You really dove in, far more than most people are willing to. But, that's everything you gave. Can you tell me what you received from doing that? OK...let me try this again.....personal benefits to me? A sense of hope. Feeling good about putting action and intention into something that is important to me. Seeing the truth that the things most precious to me in life take not just desire but intention, action, and commitment. I have learned that the more intention, action, and commitment I put into something the greater the reward will be. I have learned that I am able to co-create the things in life I have longed for. I have learned that giving up does not serve me. I have learned that the status quo, while safe, does not serve me. I have learned to let go of what does not serve me or bring me happiness and that the only way to have the life that I truly desire is to let go of my fear, be willing to risk rejection and disappointment, put myself out there, and be patient! Beautiful. Love it! And now the flip-side. To be fair and honest, what has been the hardest, or most disappointing part? Hard? Nothing! Honestly, nothing has been hard. It has been sheer joy for me to be so involved. Being an Ambassador could practically be the job description for who I am as a person. It suits me, it lends itself to the gifts God put me here to share with the world, and it is completely me! It comes naturally to me and I am good at it…not to be a braggart, just to speak the raw truth of it. This is who I am. As you describe in your book, I am a 100% initiator and bringer together of people! I think the most disappointing part has been something that you actually spoke about in your book. I appreciated reading in Chapter 6 you saying, “I cringe when I hear that….several women cancelled their attendance at a ConnectingCircle the day before-or worse, someone simply didn’t show up.” I absolutely lean in the direction of naivety and thinking that everyone has the same jolly, happy, this-is-so-fun, let’s-do-this attitude as I do. But the truth is that even people who take the time to sign up for GFC have different levels of desire and commitment. And all I can really worry about is to continue my own level of desire and commitment, knowing it will lead me to who and where I am supposed to be. I also appreciated reading you say that, “The girl who showed up may feel embarrassed or frustrated, but she has proven to herself that she is willing to be present for something that she says is important in her life. I believe that energy will serve her.” These sentences touched my heart because that is a principle I think I have spent my life standing on even if not everyone else who has been in my life has. What has been one of your best memories as an Ambassador so far? Well…that is an easy one! It is at your book launch party when I asked you a question and one of the women I was with told you I was an Ambassador. Then after telling you my name you said, “Oh yes, I know you. Maci told me I HAVE to meet you and that she thinks you are great and so wished she could have come here just to meet you!” I felt like a mini-celebrity! It was awesome to see that all the effort I had been putting in was really, really paying off…. I was with a large group of women I had met through GFC, was meeting you, was being sought after by other women there, and got to meet a woman who was there that night as the result of a flier I had put up in a Caribou coffee months previously and many, many miles away! It was an amazing night! Well that was a highlight for me, too! What a difference you've made Kathy. It's amazing how one woman can just start reaching out, and how much others will respond to that! What a difference you've made! Okay, last questions, if you were to give advice to others who might be willing to be Ambassadors in their areas, what would you like to tell them? Oh how grateful so many of us are that you didn't give up. Thank you for continuing to post events, for not taking it personally when people didn't RSVP, and for continuing to reach out and introduce women to each other. I'm so very thankful for you! If you're interested in possibly being an Ambassador for Friendship in your area, go here. But whether you sign-up or not, I hope you got lots of good ideas from Kathy's story and that it gives you the courage necessary to go post an event on the GirlFriendCircles.com calendar in your area and maybe send out a few "Let's Connect" requests to introduce yourself to other women nearby! Make your friendships happen! This post is written by Laurie Wicksman, an active member of GirlFriendCircles.com. Wow, I met Shasta Nelson (who's a knockout by the way) at a Channel 7 news interview, along with Kelly (aka. Nashville) and Michelle. Besides her successful career as a life coach, Shasta is responsible for connecting me and thousands of others with some talented and sincere women, such as Michelle (a PHD student), Laurence (a French Professor) and Larice (Coordinator at Prominent Broadcast Cable Company). Unlike, Kelly and Michelle, I wasn't starting over in a new city. I longed for quality friends, not simply the people I was friends with purely because we had a shared history. My boyfriend, Tim, and I had gotten "pre-engaged" for our four year anniversary in September. At last, I had found love. Now, I needed a real friend. Michelle, Kelly and I originally met at the first event I had attended. Although my palms were sweaty and I was nervous, it opened doors to a whole new world. Being that my fiance, Tim (my mad scientist), is away quite often at MIT, he suggested that I throw an event of my own. As mentioned on my GirlFriendCircles.com profile, Max Brenner's is a NYC hot spot. He asked me, "What do women love?" That was obvious. "Chocolate, chocolate and more chocolate." Using her great social and organizational skills, Michelle brought a successful turnout of an event to life, at my favorite restaurant. Thanks Michelle, for making it happen! For those of you who don't know, Max Brenner's specializes in chocolate dishes, including cocktails. So of course, as I had said to my fiance earlier, nothing comes between a girl and her love for chocolate. There was nothing more thrilling for me than seeing thirteen women from very diverse backgrounds come together, sharing two common interests: dessert and finding friendship. I finally felt like I was part of something fun and exciting! At the end of the day, however, what truly matters isn't who did or did not come to the party and why. Nor is it, marital status, religion, or income level that is relevant. But, meaningful relationships are inspiring one another to be the very best that we can be and not letting each other down. That's what friendship means to me. Laurence, a lovely woman of French extraction, attended my Serendipity event as well, and loved both events! These are two amazing women that I've met through GFC, and hope to stay in touch with for a long time. This was just the tip of the iceberg, however. GFC has opened the door to countless other possibilities and friends for me. What’s next in the chapter of life? I don’t know but, GFC has certainly helped me along. How many of us have a true friend? "A diamond in the rough" is priceless and difficult to come by. You just have to keep looking and you'll get lucky. I did. Thanks, GFC! I'll never forget you! Note from Shasta: It was a privilege to meet you Laurie! I'll never forget that you brought me a bag of yummy snacks (including chocolate!) while I was traveling-- your heart is made of gold. Thanks for sharing. This post is written by Michelle Scott, an active member of GirlFriendCircles.com. Last year was the most challenging year of my life for a number of reasons. I moved from the Midwest to New York City to live with my husband, who had already been living and working there for two years. I moved away from a home and life we had built together. I left a fulfilling job in which I felt valued and needed. I left wonderful neighbors, long-term friends, and family. I knew life in the big city would be different. I knew selling and giving away the majority of our possessions in order to live in a small, furnished NYC apartment would be quite an experience in surrendering and adapting. I knew making new friends would be a critical part of enjoying my new life in this new city. One surprise was my first-ever challenge in finding a job. With a graduate degree and over halfway through a PhD program, I thought landing a job would be a cinch. Enter the importance of encouraging friends. When I preferred not to express my frustrations to my husband, I could seek the advice, comfort, and encouragement of friends. They helped with networking and shared stories of how they and their friends had struggled and succeeded in the Big Apple. It was a camaraderie that I did not expect. While my friends “back home” were encouraging, there is something unique about leaning on those who live and strive in this city that never sleeps. Almost a year after the move, I am working various jobs, nearing the finish line of my education, and am better settled in New York. I now have several circles of friends I can call on to meet for coffee, share a laugh, or ask for prayer or advice. Unless you have lived in New York City, especially Manhattan, you cannot understand the pull for and limitation of time. As a student, working multiple jobs, volunteering and attempting to maintain friendships can be challenging. How does one find enough time and energy for everything that is important? My main goal this year is to be more generous with my time and my heart. I believe Woody Allen is credited for saying “90% of life is just showing up.” While showing up is extremely important, it is not always enough. I need to be able to give of myself to others. It is possible to show up and still be stingy with our time. It might come through with checking our watches or phones, giving the impression that something or someone else holds a priority over the current activity or person with whom we are engaged. A secondary goal for this year is to become more organized. Glancing through the 2012 IKEA catalog, I came across a small quote: “Fika (fee-Ka) is something all Swedes love to do. Simply put it means grab a friend, some coffee or tea, and something sweet to nibble on.” This little quote jumped out at me in the midst of the kitchen section. I’ve never been to Sweden, but I think this is what we long for: joining a friend for coffee, a sweet, and a time of togetherness. No matter your challenges or what you hope to achieve this year, let’s join together in our intentionality to show up for our friends and treat them and ourselves to the joys of great friendship. Note from Shasta: Michelle-- thank you for being a Connector in New York City, a woman who joined and immediately started scheduling events and reaching out to other members. Thank you for helping foster friendships right where you landed. Best to you in your goals for the upcoming year! If you aren't yet a member of GirlFriendCircles.com we invite you to join! And if you already are-- I hope you'll go RSVP for an event (even if you're nervous like Laurie admitted she was) or that you'll jump in and host an event like Michelle did!